Digital pen type multimeter which measures AC/DC voltage, resistance, capacitance and can be used for continuity and diode tests. 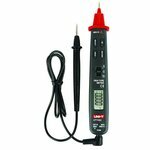 Digital pen type multimeter for measuring AC/DC voltage, resistance, capacitance, continuity and diode tests. 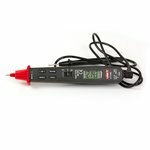 Tweezers-shaped digital multimeter for SMD testing and troubleshooting. Measures resistance and capacitance, tests diodes and continuity.